This summer, we relocated to the Holiday Beach to make the most of the sea, summertime, and recreational living. Figuring out what to do about Wi-Fi, however, gnawed away at us, because Lord knows you can’t survive on the astronomically expensive mobile data packages available in Lebanon. Of course not. We needed broadband internet. But as any layman can attest, broadband establishes a connection to the internet over existingtelephone wires. The chalet lacked a landline, so before we could even hook up Wi-Fi, we needed to apply for a phone line. My husband and I started to sweat bullets. 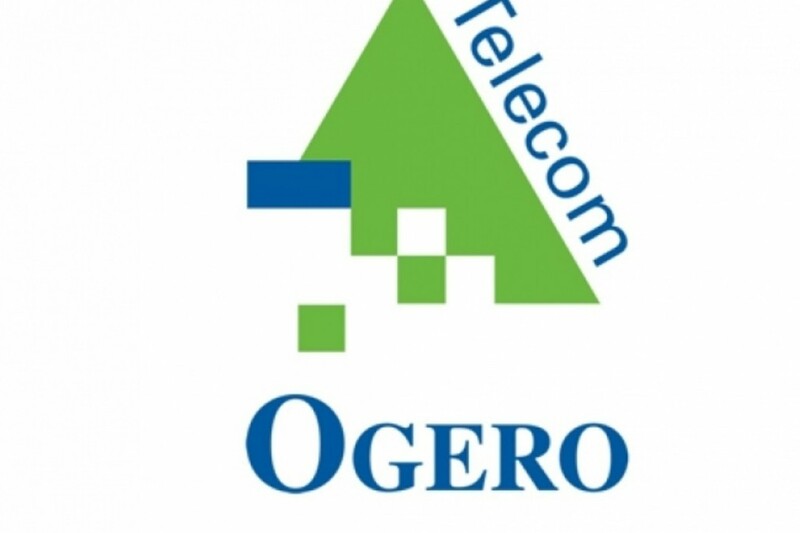 Two decades ago, when my parents put in a request for a landline from Ogero, not only were registration fees horrifically high, but the time it took for the application to be acknowledged and a technician to be dispatched saw an entire season pass. And those of you who reside in Lebanon know I’m not exaggerating. In recent years, I’d learned that prices had since come down to reasonable levels, but I was still skeptical of the wait period, so I did what any other savvy social media millennial would do: I tweeted @Ogerotelecom. Within an hour or so, I received a call from a certain Fouad at Ogero, walking me through the steps and timeline for subscribing to a consumer phone line. Straightforward enough: visit your local Ogero Sales Office, complete an application form, append a copy of your ID card or passport as well as a copy of the title deed, title of rent, or residence certificate. Fees? 7,000 LBP out the door. That’s less than 5 bucks! On a Saturday morning, we visited Ogero, and the process was indeed effortless. Monday morning, a technician called, notifying us that he’d passed by Holiday Beach, but the compound's telephony maintenance officer was absent and that he’d return the following day. Lo and behold, he did, and we had an operating line just two business days after our application submission! Miraculous? Apparently, it’s the new norm. Next up, broadband internet. 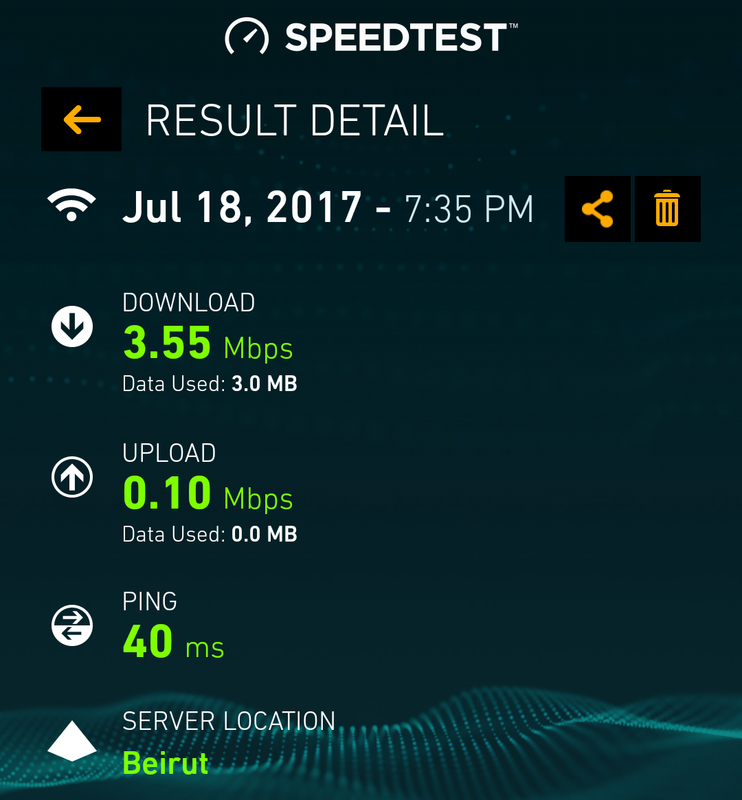 We asked Fouad to determine the rate capacity in our area, and after brief testing, he ascertained that the 4-Mbps package was most suitable to the speeds available in our residence. We expressed interest, and he took the reins on the rest of the procedure. To set up an ADSL wireless modem, we’d be charged 132,000 LBP (USD 88), which would be defrayed over the course of a full year, at 11,000 LBP/month. Once functional, a 4-Mbps speed with usage limit of 50 GB download and upload would incur a fee of 50,000 LBP + 10% VAT per month. As of last week, a new price schedule has been released, which slashes prices by over half to 24,000 LBP/month. Precisely two weeks after our landline was wired up, we had internet at our chalet, and the Speedtest app determined a download speed of 3.55 Mbps and an upload speed of 0.10 Mbps. The latter is admittedly pathetic, but to our great relief, it’s become readily conspicuous how much the new Chairman Director General of Ogero Imad Kreidieh and his team are doing to bring Lebanon up to speed (pun intended) in the world of broadband internet. 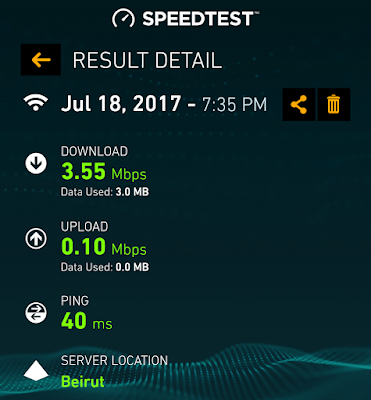 We’ve been enjoying Wi-Fi for nearly 10 days now, and except for some opprobriously slow speeds during the nightly peak hours, we’re satisfied with Ogero’s services. Rome wasn’t built in one day, and slow and steady wins the race: two adages that adequately describe where we stand and where we’re heading under the new leadership. But patience is a virtue (there’s number 3! ), and good things come to those who wait (#4!). So let’s all hang in there and be positive. For change is unmistakably on the horizon. Special thanks to Ralph Aoun for facilitating my interaction with Ogero, and to Fouad S. for coordinating the entire application and installation process from A to Z.